Temperature Sensors like Thermocouples need cold junction compensation as a part of front end signal conditioning, this is done at the terminal block where the Thermocouple wires are terminated. This design has to be more accurate and broad, if the design we make has to work well in both Tropical and Temperate Climate Zones. 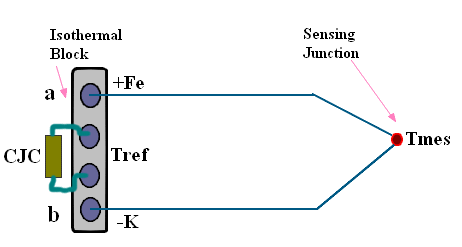 If wires of two dissimilar metals are joined at both the ends and the junction formed at one of the ends, is heated more than the other junction, a current flows in the circuit due to Seebeck thermal emf. This effect is used in thermocouple temperature sensors. The Peltier effect is the converse of above Seebeck effect, which means that if a current is forced through junctions of dissimilar metals, the junction will generate heat or absorb heat (cooling) depending on direction of the applied emf. This effect is used to make portable and small refrigerators.